I used to use it off road all the time, but with a freewheel. I fixed it last weekend, and road it around some dirt trails around my house -- not technical. It is not a good bike for technical ridding due to the obsolete geometry so i probably will not take it on the trail much. I set it back up for two reasons: Because i hated seeing the frame hanging in the garage; And i wanted a good winter commuting cycle. Just picked up a specialized mtn bike. sakae crank, alloy rims. 21 speed. everything is clean and well taken care of except the paint, lots of nicks in the areas where it was lashed to a motorhome or trailer. Thankyou, may I have another!? Sure looks purty. Got A full drive side shot? Damn! look at that wheelbase. I think I can fit my leg between the rear wheel and seat tube. 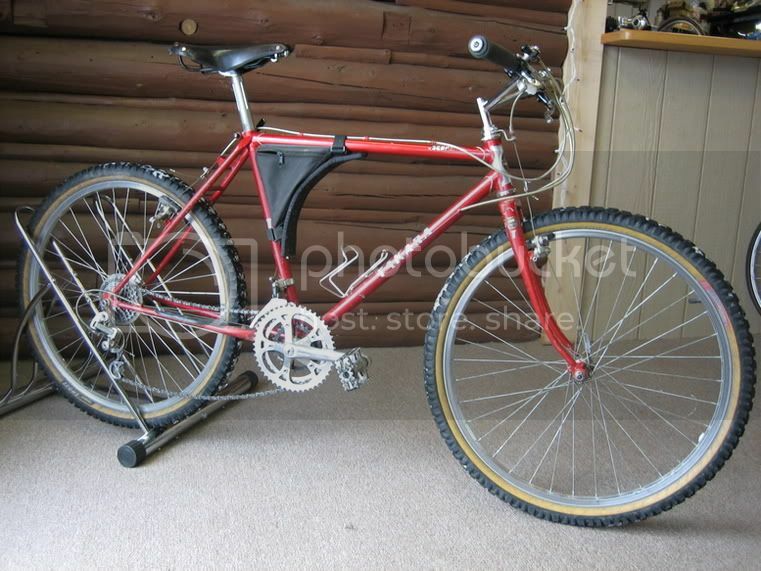 What other old school MtB had super long wheelbases like that? A few enlightened builders and east coasters who were more into technical/woods riding were evolving toward the modern hardtail geometry and by the mid eighties they were all getting away from the looong laid back style of the early days. The Takara is a small frame and that makes the chainstays look disproportionately long, but that said , they may be some of the longest out there. Now I'm curious I'll have to go measure them. New to this forum, so heres my baby, a kestrel MXZ , not sure exactly how old but I have always badged her as a 1990 but I have heard they started building them in 1987, any info/scans/articles on the matter would be appreciated. Articles? You know this one? So you piqued my curiosity. The stays measure a whopping 19"! No wonder it's difficult to wheelie that thing! The old Schwinn cruiser sitting nearby has 18 1/2" stays. I can't find specs on the real early Ritchey's but '84 models had 18" stays. From center axle to back of the seattube I'm getting maybe 17. Somebody on this board thought the rear might have been off a different frame and Tom was making heavy race frames and playing with the triangles. What year is your bike? I am measuring from center of BB to center of axle. I think that is how most manufacturers do it. Right? That would put yours closer to what Ritchey's '84 catalog lists as spec (18"). That way mines 17 inches, it is a '90. 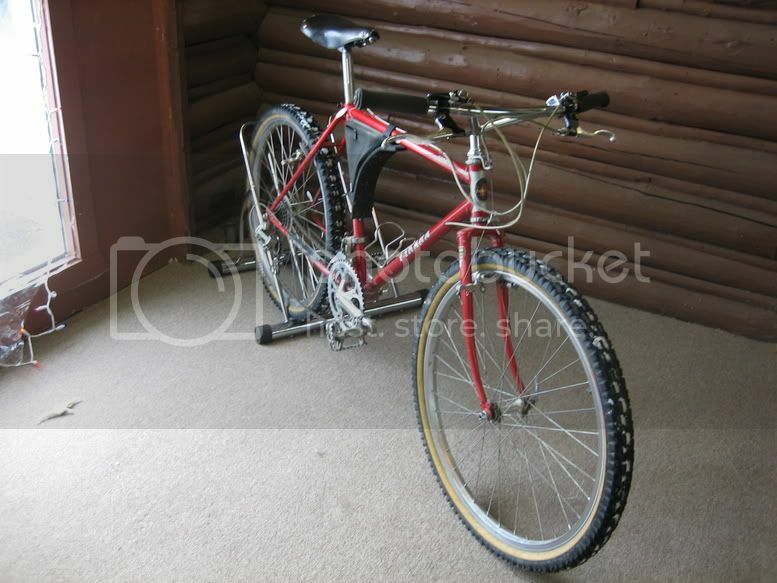 Was not a 'common' bike, probably intended for NORBA races. I've seen others here (Can) and though they had the same decals -different frame style. Some wierd batch of Tom's odds and ends dumped in Canada through Rocky Mountain likely. I've a prototype P-23 as far as I can tell, mines just made of a heavier steel grade. My frame is Tange Logic, the steel used for the unicrown forks. I really doubt the Kestral pic'ed above was made in '90. Pretty advanced if it was, neat looking frame! Last edited by jeff williams; 12-18-05 at 05:48 PM. i don't know - it looks like i remember them looking back then. particularly that grey colour. plus the steel unicrown fork and thumb shifters are the right period as well. i remember that elevated chainstays were in vogue for a while in the late '80s and early '90s as a cure for chainsuck. on an early monocoque like that Kestrel, chainsuck would have been a very bad thing. so the elevated stays would make sense. Looks wicked, really interesting geom and casting?=Monocoque (spelling)? Anybody know much about them? I couldn't get that link to work so I fished around and found this link worked. I just bought a 1989 Trek 970 frame that I'll be building up soon. I can't wait to get this lugged baby put together. I'm not going for a restoration, but I think the parts I choose will do it justice. Thanks for all the inspiration in this thread! I've blundered into a '94 Trek 830 frame and a '96 Trek 850 (almost complete) recently. I think calling them vintage might be a bit of a stretch, but I've learned a lot and also gotten inspiration from this thread. That, and knowing I'll soon be able to send that Magna to a better place soon, have kept me going. I'd be a little concerned about running that stem so high. Are you sure it's not past the minimum insertion mark? BTW, I love the look of that stem, the way it mimics the top tube/seat tube juncture. If you plan to swap it out looks like you need a stem with a bit more rise. Yeah, my brother in law set it up that way, I think it is a bit high too but he likes to ride sitting very upright. I too like the stem but this Syncros one I have is just beautiful I cannot wait until spring to get the powdercoating underway; it will be like having a new bike.